Soon you'll see up to 16 plug-in Chevy Camaros, but they won't be the work of Chevrolet. "General Motors is continuing its partnership with the US Department of Energy and Argonne National Laboratory for the EcoCAR 3 collegiate advanced vehicle technology competition and will donate a Chevrolet Camaro to each one of the 16 universities that were recently selected for the exclusive competition." For those unfamiliar with EcoCAR, it "challenges university students across North America to design, build and optimize eco-friendly powertrains." The finished vehicles will be unveiled in 4 years. 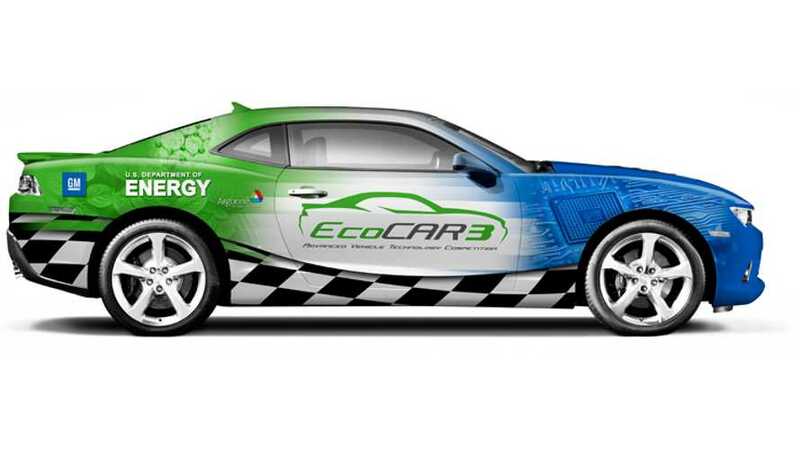 Several will likely be plug-ins, as that's been the norm from the previous EcoCAR competitions. Aside form donating Camaros, GM will provide each team with "$20,000 plus an additional $10,000 in program-initiation funding for teams who were not previously included in the EcoCAR 2: Plugging In to the Future or EcoCAR: The NeXt Challenge series in an effort to diminish any disadvantage for new teams." The starting point is a bone stock Camaro. The ending point, 4 years from now, is all up to the individual universities. We may see fuel cell vehicles. Possibly plug-in hybrids. Maybe some ethanol burners or even some sort of solar-powered pure electric. It's in the hands of the universities now to create the most advanced, efficient Camaros we've ever seen. "The new four-year competition, EcoCAR 3, will build upon the 25-year history of the U.S. Department of Energy AVTCs and seeks to develop the next generation of automotive engineers with unparalleled experience designing, promoting, and building leading-edge automotive technologies. The goal is to minimize the environmental impact of personal transportation and illustrating pathways to sustainable transportation with various levels of vehicle electrifications, such as Plug In Hybrid Electric Vehicles (PHEVs). Argonne National Laboratory, a U.S. DOE research and development facility, will retain the management and operational responsibilities of the AVTC series."